This week, we’re finally seeing the release of an all new Rockstar Games release! Their most ambitious project yet is Red Dead Redeption 2 and it’s looking absolutely fantastic! With a massive team behind this release, it’s a sure thing we’re getting another triple A quality production. The whole theme overall focuses on being an outlaw, bringing that rich feeling back that makes Rockstar titles so enjoyable. Getting to play the questionable protagonists who venture out in a huge open world. The original was something else with an incredible sense of scale. In games like Grand Theft Auto you find ways to move around fast. Being left out in the wild west, you felt the weight of how immense the landscape is. Even on horseback it took time to get from one location to another. Not that the first Redeption didn’t have beautiful locations, but you have to remember that it was technically a last gen release. The set pieces alone for RDR2 just flood your imagination with what is possible in this rich and detailed world. When Rockstar says they’re aiming to create a living world, you do really need to take notice. After all, even Grand Theft Auto is more than just it’s missions with a pretty place for them to happen in. You can explore the world and really take everything in. What else is in store this time? There’s sure to be tons of delightful surprises. Back to the first RDR, meeting strangers was a new thing. Events would occur as you wandered the desert. These could sometimes go hilariously wrong as you just rode up on them and watched as they triggered into ambushes. I still remember a time I’d captured someone and then rode into one such situation. They at least made a good bullet sponge on the back of my horse as I made my escape. 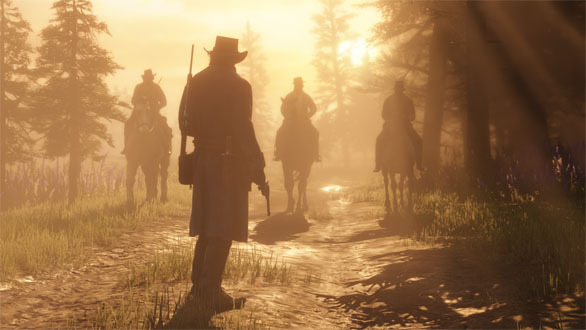 Things improved though in Grand Theft Auto V and surely there will be new systems in place to further make this world more interactive in RDR2. Don’t just take my word for it. Take a look at the gameplay itself. Red Dead Redeption 2 will be released this Friday, October 26th on PS4 and Xbox One. Copyright © 2019 Darkain Arts Gamers - Take Me Home, Country Roads.